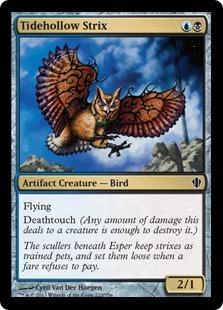 APDC, the current PDC Block event (incidentally sponsored by mtgotraders.com), is almost overwhelmed by the predominance of Esper decks in the metagame, thanks to the innate brokenness of Esper's core cards and their absolutely phenomenal synergy. During the past weeks a new deck, BR Blightning, seemed to be competitive enough to hold the fort against the artifact overrun but in the last event it had to give up the 1st place once again; At the moment, there have been already 9 APDC tournaments and they've been all but three won by skilled player with artifact-filled decks. There are at least 3 basic variants, one focused on control, one on aggressive play and one that's just in between; however, the more successful versions are the first and the latter, with aggro playing the role of the rogue deck that just hasn't proven itself (yet!). The first deck we're going to analyze is the first that actually stormed the beginnings of this APDC season, the Strixy variant. There are actually two sub-variants of the list, mainly because the deck was piloted by two different players that tailored it to their personal style. Two players, Daved and wlchr, won by themselves the first five events, splitting them 3-2. I'm going to analyze Daved's list, which went 6-0 in APDC 1.03: we can see how the main synergy is the one between the two Strixes, the blue capsule and the ever-useful Sanctum Gargoyle, which is so good to be worth a white splash by itself. The other cards just add control options to the mix, with the tempo-bomb Sedraxis Alchemist paving the way for airstrikes and the usual mix of counterspells and removal. Soul Manipulation, while arguably not the best counterspell in the format, fits the deck just perfectly by adding even more recursion. A quick look at the sideboard shows even more control options ready to be sided in against aggressive decks. 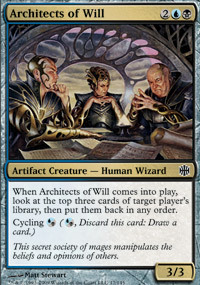 The main stars here are the Architects of Will, a very powerful card that can serve the double purpose of smoothing one's own draws when things are beginning to look grim or severely hinder opponents' midgame by filtering their draws and making sure they have the least threatening cards in their hands. This can be done repeatedly thanks again to the recursion engine powered by Sanctum Gargoyle and Soul Manipulation. Deft Duelist serves the double purpose of being an early stop to aggressive decks and a solid finisher for the late game, while Ethersworn Shieldmage is just an extremely good combat trick which happens to have a bear attached. 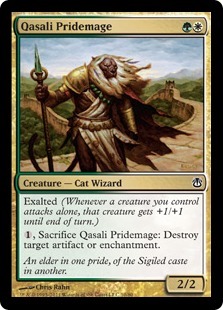 The deck also has a ton of generic removal maindeck plus some more focused answers in the sideboard. Brainbite, while expensive to cast, helps a lot in the mirror match taking away control options from opponent's hand while refilling your own. The deck was piloted successfully by moromete, who went 6-0 in APDC 1.07, and demonic_attorney who, by his own admission, netdecked it to a flawless victory in APDC 1.08. However, he made some subtle changes to the list including 4 Esper Stormblades for a more aggressive twist and removing 2 Soul Manipulations, 1 Relic of Progenitus and 1 Architects of Will. A somewhat rogue deck that made the cut just by being my favorite. Yet, I think it's good. Ethercaste Knights are there to spice things a little in the late game by exalting an unblockable Hulk, while Oblivion Rings and Crystallizations make up for lack of stronger removal; Courier's Capsules prevent the deck from losing steam on the long run by providing the right amount of hand refill and being reusable via Sanctum Gargoyles. These are also useful in getting back that cycled Glassdust Hulk that wasn't quite playable from the very beginning of the game. So far, no one piloted this list in any event, probably thinking it was too much oriented towards artifact hate and with little to no chance against anything else; but this is yet another story, and, again, the possible theme of another article. However, I want to focus on the other side of Magic's color spectrum, away from the canonical "GW hate" approach; after much grinding of the rusty gears that fills my head I choose to take the so-called "SporeCry" approach to the matchup: "care not about opponent's plan and just bring on your own agenda". To do so, we'll need a deck that's fast enough to race against the opponent in a headlong rush towards the inevitable end. Here's what I call "having my own agenda": the only thing that worries me it's to bring out as many mana sources as possible while beating down on the opponent with the aid of early removal and cheap pump spells. 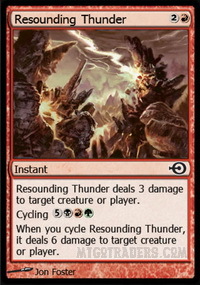 Once 8 mana sources are out - and the process usually put some dents in the opponent's life total, thanks to Exploding Borders - we can start with our finisher: cycle Resounding Thunder for the win. It's very fast to play right off the bat and has a decent mid-late game, even if it eventually runs out of steam. Elvish Visionary is here to help by auto-replacing herself and chump-blocking for lifepoint preservation, but it's barely enough to hold against heavy Blightning storms. The other cards are the usual mix of cheap, aggressive creatures that inhabit the Naya shard plus the Jund addition of the little but nimble Hackblade. Also, I didn't realize how good Rhox Brute was until I played it in this deck: attacking with him and Colossal Might mana open is something that just has to be experienced - at least if you're not a cold-hearted artifact lover. Ideally you'll just need one Resounding Thunder and a couple of Exploding Borders to win the game, so the remaining Thunders could be also used as emergency removal if you run out of Magma Sprays or if they're not enough to bring down the largest threats. I brought the deck out to play in the last round of APDC 1.09; since I was late Alotrel, APDC main host, kindly accepted to enroll me with two losses. i really wanted to try out the deck so he played against me in an Epic Match in which I lost 1-2 to his Valeron United. More on that as soon as replays will be restored on MTGO. This deck is really similar to mine, but it's more focused on early beats and was piloted by far more skilled players: Boin won APDC 1.09 with a flawless 6-0 matches, 12-0 games record. I have nothing to say but congratulations! August 1st the invitational-only APDC Worlds will take place: who will come out as a winner, the deck that dominated the entire APDC season or one of the newcomers that rocked last week's meta? Even if probably won't make the cut I'm planning to be there just to see what's the outcome. Can't wait. Really. Meanwhile, have a good time with mtgo and all things magic-related! The Nacatl Beats deck is seriously wicked. I ran a version of it in MPDC this week to a top 4 finish. Would have done better if not for a few mistakes (some I noticed and a couple Hokusai spotted). You could easily port this deck into std and play it as is and do well. 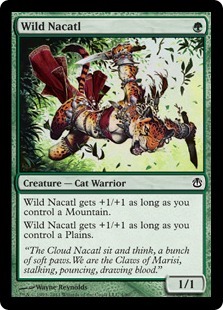 Yes, the Nacatl Beats deck is really good. It's a pity there will be just one more Pauper ALA Block event, I think it would have been interesting to see how the meta would evolve with another 5 or so events. APDC is not actually sponsored by MTGO Traders, although I love buying cards there. This was a great read, thanks for writing it. Hope you'll cover Worlds in a future article! Anyway, I'm going to try and do my best with Worlds coverage. Thanks!